Have you ever felt like the things associated with one particular planet pervade every aspect of your life in every possible way? In this post, you’ll learn which planets in your chart are the loud ones which want to be heard in every area of life. This is part of a series of lessons on the basics of applied Hellenistic astrology. In the last lesson, we looked at the basic significations of the planets. There is also a zero lesson on some history and preliminaries. In this post, we’ll learn about planetary advancement, also known as the operative degrees or busy degrees. This will allow you to start figuring out which planets are louder or more pervasive. If you haven’t already done so, please read the past lessons and spend a little time thinking in terms of the planets before proceeding. Please download the PDF of the full English translation of the Anthology of Vettius Valens (click here to open the PDF or right click and choose “save as” to download). Not only is it an indispensable and enormous text of Hellenistic astrology, but it begins immediately with Valens on the significations of the planets. Contrary to popular belief, you don’t need to spend hundreds of dollars to obtain really good software for traditional astrology. As we learn about how to read a chart in this lesson, I’ll walk you through pulling up charts using the free online Astrodienst (astro.com) charting service. In a future lesson, I’ll show how to use Morinus, a free and advanced open-source traditional astrology program. First, you should pull up a copy of your chart using Astrodienst, which is at Astro.com. It is free to register with the site and the process is easy. Click Login in the upper right corner, then “Create a free registered user profile” and follow the instructions. After registering, you will find that you are faced with many options for computer-generated readings. I don’t recommend any of the readings on the site. We are going to use the free chart-drawing service. The section of the site called “My Astro” allows you to store birth data for easy access to your charts from the internet. First, you will want to have your birth information handy. The information that you’ll need is the date, location (city), and time of birth. Typically, a birth certificate is the most accurate source of this information. Obtain this information before proceeding, either of your own birth or that of someone of interest. With the birth info in hand, log in to Astrodienst and click the “Add new Astro data” link. Fill out the Birth Data Entry and click “Continue”. Make sure the correct town is selected and click “Continue” again. If this is your first time using the program you might be taken directly to the Free Horoscopes page, but if not then click the “Free Horoscopes” link from the top bar. Scroll down and choose “Chart Drawing Ascendant”. This is the option that will do for now, even though it includes a lot of additional information we will try to ignore. Click on the chart to pull it up in a window of its own, where you can right-click and choose “Save Image As” to save the chart to your computer, or press CTRL-P to print the chart. The chart should look something like what is below. In your astrological studies, a time will come when you’ll want to check out the charts of celebrities. There is a database of celebrity charts that is now maintained by Astrodienst and integrates with its My Astro chart collection. This database is called Astro-Databank (click to go there). Let’s say that you want to add Angelina Jolie’s chart to your own chart collection. You would type “Angelina Jolie” in the Search box and then click her name from the list of results. This will pull up her biography and chart information, with a small chart that you can click to enlarge (click here to go there). Make special note of the “Rodden Rating” which is an evaluation of the accuracy of the birth information (AA is best, while anything C or below usually shouldn’t be trusted). To add birth information to your collection click the link “add Angelina Jolie to ‘my astro'” which appears below the grey box. There is much on this chart drawing that you should ignore for now, including all the red and blue lines jutting around the chart. For now imagine that the small center circle inside the chart, around which the numbers appear, is the sphere of the Earth. Look at the four bold black lines that jut out from that sphere. These 4 lines are much like the “cross-hairs” of the location. It is as if planets on them have arrived at the location. Those moving toward them (clockwise) are arriving. After passing them, a planet is leaving the location. These 4 points are called the “Angles” or “Pivots” of the chart. Planets on them signify extremely prominent or pervasive influences on life circumstances. The horizontal line is the horizon at the place you were born. Horizon is in the word horizontal so that should be easy to remember. Notice on the left that it is marked with an AC, for Ascendant. On the opposite side, there is a DC, for Descendant. The Ascendant is where planets rise or “ascend”, while the Descendant is where they set or “descend”. The Ascendant is toward the east and the Descendant is toward the west, as “the Sun rises in the east, and sets in the west”. A planet above the line is above the horizon, in the sky. A planet below the line is below the horizon, under the earth. You will notice that there is a planetary symbol at Angelina Jolie’s Ascendant. 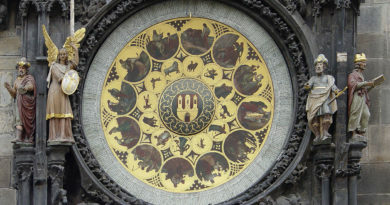 The symbol is that of Venus. Matters symbolized by Venus are therefore pervasive in the circumstances of Jolie’s life. The significations of beauty, love, creativity, the arts, and sensuality are very “loud” in her life. 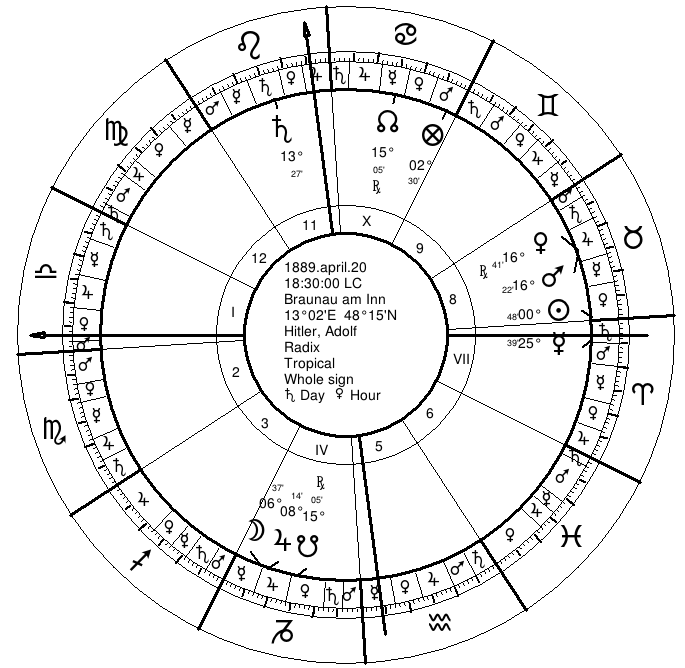 For astrological purposes, a chart is a day chart or diurnal if the Sun is above the horizon, while a night chart or nocturnal if the Sun is below the horizon. This is known as the sect of the chart. The symbol for the Sun is above the horizon in Jolie’s chart, so she was a day birth. We may think of Angelina as of the diurnal sect. The vertical, nearly perpendicular lines, are the meridians, like the vertical lines you see on a globe. The top one is where the Sun reaches its highest point or “culminates” up in the sky, at the natural “Noon” position. The bottom one is the meridian on the other side of the earth, where the Sun anti-culminates under one’s feet at the natural “Midnight”. The top line is called the angle of the sky, medium coeli (“middle of the sky”), or midheaven, abbreviated MC. The bottom angle is the angle of the earth, called the imum coeli (“bottom of the sky”), abbreviated IC. If one is in the northern hemisphere, the MC is exactly due south, because we are looking south toward the equator of the Earth when we see a culminating planet (for example, the Sun at about Noon). The IC is due north. Thus the astrological chart is like an upside-down map as far as directions go. The top is south, the left is easterly, the bottom is north, and the right is westerly. Looking at these additional two “Angles” we see that Angelina Jolie has one planet on the MC. That planet is Jupiter, the planet of fortune, opportunity, gifts, generosity, and social benefits. The numbers next to Jupiter’s symbol are the degrees and minutes of the sign where Jupiter is located. These are coordinates of its location. Notice Jupiter is at degree 17, as is the MC. They are in the same degree out of the 360-degree circle. Similarly, Venus was in the same degree as the Ascendant. Because the degrees on the angles shift about every 4 minutes (of regular clock time), it is rare to find a planet in the same degree as an angle. We will consider a planet on an angle when it is within about 3 degrees of the angle (a little more than that when dealing with the Sun and Moon). Notice that Mars is at degree 10, which is about 7 degrees from the MC, so we wouldn’t consider it on the angle. The Moon is at 13, which is about 4 to 5 degrees from the MC, so we would judge the Moon to be of increased prominence as well in this chart by this method. This idea of a planet becoming more prominent when it reaches one of the angles predates the advent of horoscopic astrology. It is a feature of geographically disparate astrological traditions, and it is an easy concept to grasp. It is also evident in Hellenistic and Persian astrology (more on this below). Additionally, it is related to one of the most important predictive techniques of traditional astrology, primary directions. This is why I feel it is important to learn it early in one’s studies. A quick survey of archaeoastronomy reveals that for thousands of years people paid close attention to the moments when important planetary phenomena would reach the angles. This is evident in the construction of temples, monuments, and sacred sites the world over. For example, El Castillo, a step-pyramid at the center of the Mayan Chichen Itza, has a western face that points to sunset (Sun on Descendant) on the traditional date of the start of the rainy season. Similarly, Stonehenge has important alignments to risings and settings marking the annual transitions of midsummer and midwinter. Karnak (in Egypt) and many other such sites reveal similar attention to risings, settings, and culminations on key days of the year. These monuments all draw attention to the time of a planet’s “arrival” to the location by using its crosshairs, the angles. You’ll notice that few people have planets actually conjunct (i.e. on or at) an Angle. However, while this is the most powerful position, Hellenistic astrologers did attach increased importance to a planet approaching an angle, and decreased importance to one receding from an angle (more on this below). The exact definition of when a planet is considered to start advancing and when it is considered to stop retreating varies slightly with different authors but the idea is the same. The idea is that a planet’s significations become increasingly strong or busy as it moves closer and closer to the angle, becoming strongest when it is conjoined to the angle, and then quickly dropping off until it has traveled sufficiently toward the next angle. You may recall that a planet rises at the Ascendant, culminates at the MC, sets at the Descendant, anti-culminates at the IC, and then rises again at the Ascendant. This clockwise motion is called the Primary Motion and is shown below. The concept of advancement and retreat was confused for a method of assigning topics to the signs, called the house system. In modern charts, including this one provided by Astrodienst, the space between any two angles is divided up into three segments. These are numbered for houses, but actually should be used for evaluating advancement and retreat. Planets in one of the segments that is right after an angle by primary motion (marked 3, 6, 9, and 12 on the chart) are “retreating” from the angle or “inoperative”. Those that in other segments are advancing. Those that are in the segment just before and up to the angle (1, 4, 7, and 10) are even more advancing or “operative”. Therefore, looking at Angelina Jolie’s chart, we judge Venus, Jupiter, and the Moon to be especially busy or “loud” because they are conjunct angles. By contrast, we judge that the significations of Saturn and Mars are overall much quieter in the life because they are retreating. The Sun and Mercury are advancing but not very strongly, so they are middling in terms of the “loudness” of their significations in the life. Rather than viewing advancement and retreat in a discrete way, where we chop things up into strong, middle, and weak, I tend to view it as a continuous matter of a planet being of very low volume after separating from an Angle and then volume gradually being turned up on it as it nears it. Planets approaching an angle within about 15 degrees or actually conjunct an Angle I take to be especially loud, and I will call them “strongly advancing”. A beginner should take some time getting used to the significance of this technique. This busy-ness is not necessarily in terms of personality or what someone’s known for. It is quite possible for a retreating planet to have great significance for a person’s character or profession, and likewise possible for a strongly advancing planet to have little relevance for characterizing these things. The basic idea is simply one of general strength or busy-ness, where I think the metaphor of “volume” as on a stereo, comes in handy. Because the volume of Venus and Jupiter are at the full crank in Angelina Jolie’s chart, we imagine that the things those planets stand for are pervasive through the life, including the people, events, and things encountered in it. It’s as if the life is being pumped full of Venus and Jupiter energy or those gods are very busily at play there. In Angelina’s case, Venus and the Moon are also very significant for the character and personality, but this is not because of the advancement, but due to other factors we’ll cover later. The only thing that advancement tells us is that the significations are loud and likely to be quite broad. The person is nearly constantly encountering things signified by that planet for better or worse. I follow Dykes and Robert Schmidt of Project Hindsight in distinguishing these busy degrees from the advantageous places of Timaeus (more on those in later lessons). The advantageous houses or places are those that have a certain relationship with the rising sign (signifying the self) so they are advantageous in a more personal sense (i.e. good for the individual). Advancement is a relationship to the birth itself (the location of the chart), so pertains to the life circumstances as a whole (i.e. busy in the life). Advancement is a concept that tends to be ill-understood today. Advancement was used primarily within the context of the longevity techniques of Hellenistic astrology (techniques to determine the length of life). 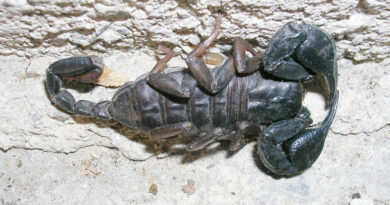 It became a more basic part of astrological technique during the Persian period. In the Hellenistic period, the regions approaching the angles were often singled out as particularly busy or operative degrees. Those receding from the angles were singled out as inoperative. The origin of the doctrine appears to be an early lost foundational text attributed to Nechepso. In this work, the four places of the angles and those places following them (in the order of the signs) were viewed as the 8 busy or advantageous places. The other four were seen as diminished in operation. 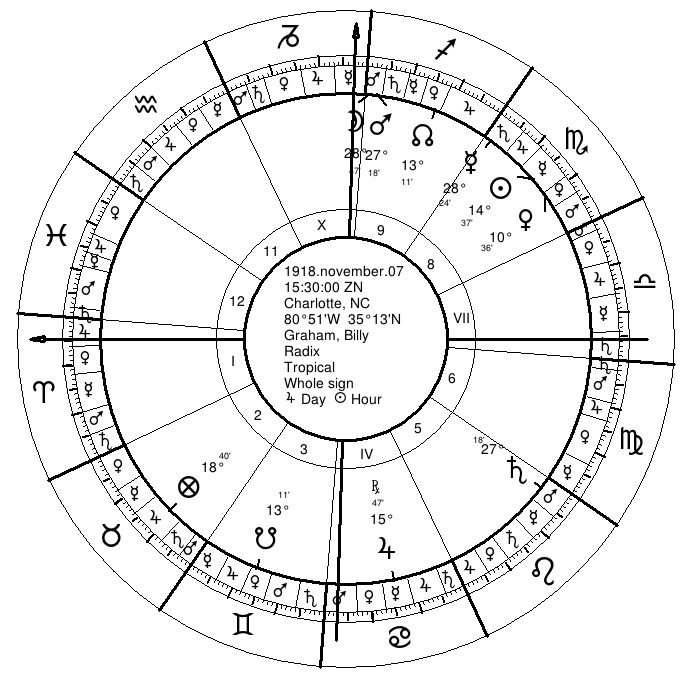 As a number of separate Hellenistic astrologers set up quadrant-based divisions (i.e. based on the four regions created by the angles) to find the busy degrees in the context of the length of life technique and the 8 advantageous places of Nechepso appear to figure into the technique, it is likely that quadrant-based divisions, the 8 advantageous places, and the operative degrees all come to Hellenistic astrology from the Nechepso text in the context of the length of life technique. As this technique is quadrant-based, it inspired the later widespread adoption of quadrant house systems (Lesson 6 will discuss houses). A house system is a means of assigning twelve major topics of life (such as marriage, children, friends, etc.) to different areas of the chart. However, in Hellenistic astrology the quadrant divisions are almost exclusively used to determine the busy-ness of the planets, not to assign topical categories to areas of the chart. When it comes to assigning topics we will do so according to the order of the houses of the planets (i.e. the signs) as the Hellenistic astrologers did. I adopt the Arabic terminology for the technique which uses the language of advancement (‘iqbal) and retreat (‘idbar). This terminology readily captures the physical phenomena of the planet advancing toward the key crosshairs of the location and then retreating. It also captures the most salient indication I’ve observed related to it, which is that of increasing and decreasing loudness across life circumstances. The Greek terminology in which it is characterized as busy (chrematistikos) is also helpful. Valens gives a good thorough exposition of advancement in Book III, Chapter 2 of the Anthology. The chapter is dedicated to explaining the concept which for Valens defines the “operative”, “average”, and “inoperative” degrees (not to be confused with the operative and inoperative places which are another matter). Valens finds the operative and inoperative degrees by dividing the distance into thirds by zodiacal degrees. For instance, if there were 120 degrees between two angles, then each third would be 40 degrees in length. He instructs to make the same type of division between each of the angles. He describes the power of the thirds as follows. In the above quote, he seems to imply that a planet becomes more malefic (i.e. “bad”) when retreating. However, I think Valens is referring to it being bad when a major health significator is in such a position because it is weakened. My experience is that retreating planets do not signify as prominently, but do not signify more malefic things, i.e. that it is a general strength consideration only. Dorotheus does not discuss advancement much but does have a few instances where he brings up a 15-degree rule. A planet that is not in the rising sign but which is approaching the Ascendant within 15 degrees is said to have equal power as a planet in the rising sign. This rule is found Book I, Chapter 7, #7, as well as book III, Chapter 1, #23, of Carmen Astrologicum. 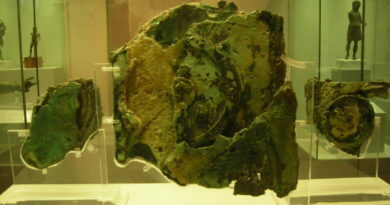 The rule also appeared in Porphyry in a section attributed to Antiochus. Ptolemy also defined certain regions of power where a planet relevant to longevity matters was to be found. In his discussion (Book III, Ch. 10) one of his regions is from 5 degrees above the Ascendant to the 25 degrees below it. Thus the region of strength here appears to be the 25 degrees up to the angle, and the conjunction seems to extend 5 degrees. Now let’s look at some example charts using a fluid sense of advancement. We are interested in finding the busiest planets. The chart drawings are from the Morinus program, but the charts are also available on Astro-Databank. I’ve provided the link to the Astrodatabank chart. Remember that here we are looking at one factor of general prominence in the life, which may be compared with volume or busy-ness. Later we will look at other factors of general prominencend factors as well as factors that signify personal prominence and even self-identification. In Hitler’s chart, Saturn (darkness, death, challenge), Mercury (rationality, writing, voice), and the Sun (leadership, power, confidence) are all very strongly advancing, while the Moon (deep significance, nurture, the irrational) and Jupiter (generosity, spirituality, loftiness) are retreating. Mars and Venus are advancing fairly strongly. In Kurt Cobain’s chart, Mercury (rationality, writing, voice), Venus (beauty, creativity, love), and Saturn (darkness, death, challenge) are strongly advancing together. The Sun (leadership, power, confidence) is retreating. In Billy Graham’s chart, Jupiter (generosity, spirituality, loftiness) and the Moon (deep significance, nurture, the irrational) are strongly advancing. Mars (violence, physical work, aggression) is retreating, but is also closely with the Moon. Take the celebrity examples from the last lesson, for Bjork, Obama, and Einstein. Look up their charts on Astro-Databank and evaluate advancement as an exercise. You will find that some planets that you thought would be strongly advancing are not so, and vice-versa. Advancement is only one piece of the puzzle. Prominence involves additional factors which we’ll get to in subsequent lessons. Think of advancing planets as loud and busy, signifying across many areas of life. Think of retreating ones as quieter, and more directed toward specific topics. Look at your own chart, and those of your friends, family, and favorite celebrities. Make note of the planets you would expect to be advancing compare that with what you find. As we proceed you’ll come to better understand the exceptions, where you met the unexpected. Dykes, Benjamin, trans. and ed., Introductions to Traditional Astrology: Abu Ma’shar & al-Qabisi (Minneapolis, MN: The Cazimi Press, 2010). 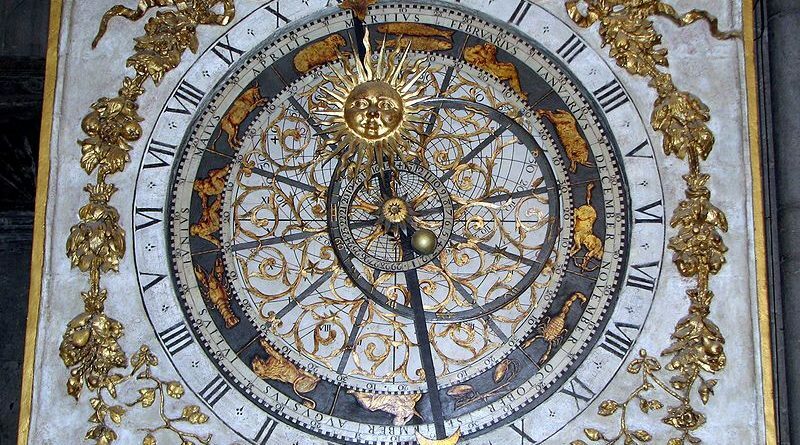 Featured image of Astronomical Clock from Cathedrale St-Jean in Lyon, France (cropped from original): This Wikipedia and Wikimedia Commons image is from the user Chris 73 and is freely available at //commons.wikimedia.org/wiki/File:Cathedrale_Saint_Jean_Lyon_Astronomical_clock.jpg under the creative commons cc-by-sa 3.0 license. 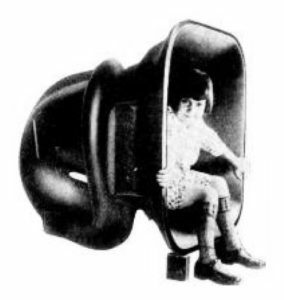 Horn Speaker with Girl by Paul G. Andres, in public domain. 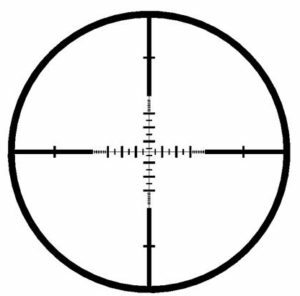 Glyphs and Crosshairs images are in the public domain. Mr. Lee had Sun at 5 degrees, and Asc at 6 degrees Sagittarius. He also had, as part of a stellium (to borrow a modern term), Venus at 1 degree, and Mars at 4 degrees Scorpio. Would you say, despite being cadent, that Venus and Mars are barely advancing rather than retreating, because they are technically beyond the 1/3 mark of the chart? It is easy to see that he is a primarily Solar driven individual, the Sun being his only classic planet not in a cadent house, and in a position of powerful advancement. It is also easy to see with Mercury being soundly cadent and retreating, while the ruler of the 10th, that his fame was only achieved after tremendous struggle. And yet, with his Scorpio stellium opposing Jupiter and Saturn (the planets of broader social context and even individual karma), that as soon as he reached the pinnacle of success, he died suddenly. The push-pull in his life is a thing to behold. I have never believed in curses, or magic of any kind, but the circumstances surrounding the deaths of both Bruce Lee, and his son Brandon, make me wonder….I am sure an element of Hollywood illusion adds to that wonder. Anyway, I tend to think that Mars is advancing here, as Mr. Lee possessed an insane amount of drive, and work ethic. Hope you don’t mind the question or the long post. I get tangenty😊 Thanks in advance. These are really great questions and observations. The thing with advancing is that it only has to do with life circumstances as a whole, for better and worse, not with the individual’s traits per se. So, for instance, if Mars were advancing, then someone may be constantly in contact with accidents, crime, violence, machismo, muscle, fires, theft, conflict, etc. whether they like it or not, and whether they are Mars-y or not. In the case of Bruce as an individual there are a few other things to look at. First is the Ascendant, and we find that he is very solar and very Jupiterian. These are his character traits. Exhibiting power, brilliance, leadership, publicity (Sun) and philosophy, wisdom, spirituality (Jupiter). On a more physical level to look at his interests and inclinations, look to the Ascendant sign itself and planets in it, and look to the Moon. The Moon (one of the symbols of his physical body) is very complex. It is tied to a number of planets. It is most closely with Mars and Venus in the sign. Mars-Venus combinations often show up with professional athletes (Mars being physical struggle, and Venus being show and artistry). The Mars-Venus themes are amplified by the Moon, Mars, Venus, and Mercury all being ruled by Mars while being opposed by a Venus-ruled Jupiter-Saturn. Additionally, Mars plays an important role in characterizing the self which is not obvious from the chart as it is. The twelfth-parts of the zodiac are a division which predates even Hellenistic astrology and are about as old as the zodiac itself. 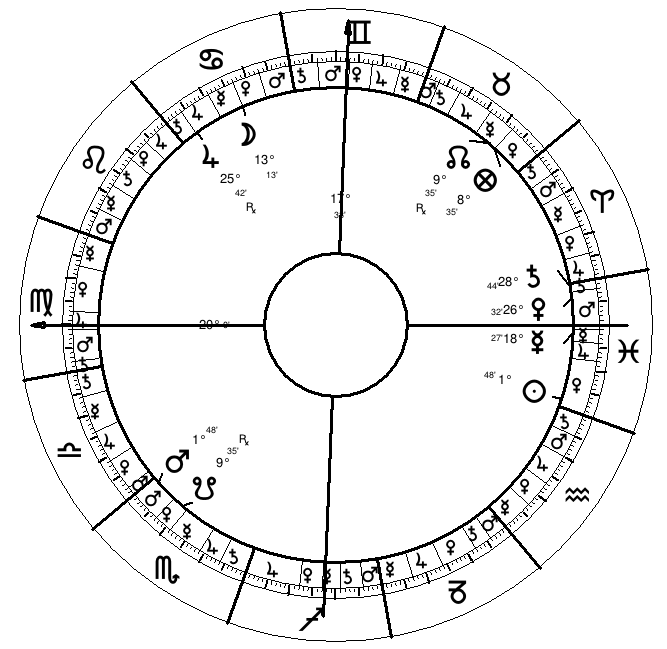 Each 2.5 degree segment of each sign is like a mini-zodiac inside the size which starts with the sign itself. So the first 2.5 degrees of Scoprio is Scorpio, and the next 2.5 degrees is Sagittarius. This puts Mars in the Sagittarius twelfth-part, which is as if it is in a secret wormhole right to the Ascending sign. In this way we say that it is as if Mars has a role in the sign of the self also, in characterizing the individual. Which fits given that his life is one engaged in “martial arts”. Read more on the twelth parts here. He was born during the day, so Mars is the malefic out of sect, and Mars has a great deal of power and access in this chart. Mars is also in the 12th house which is a dark place (it does not see the rising sign; 12th house pertains to secret enemies and social ills) and it is opposed by Jupiter-Saturn in a dark place (the 6th; which pertains to health, accidents, and employees). Interestingly, the house of children (5th house; Aries) is also ruled by Mars. Most dangerously, Mars is with the Moon, as the Moon is an symbol of the physical body. In Hellenistic length-of-life techniques, the Sun here would be the hyleg because it is on the Ascendant and it is a day birth. Interestingly, around age 32-33, Mars, moves by primary direction to the sextile of that Ascendant-Sun conjunction (the nature of the classical aspect is not important, as a planet will make about one classical aspect by primary direction in a life-time). We would say that the death corresponded with the direction of Mars to the Sun-Ascendant conjunction.